Physical gold is a common investment commodity. 2. What Causes the Price of Gold Stocks to Fluctuate? Precious metals like gold and silver have been used as a store of value for hundreds of years. The value of gold does not depend on any single currency, government or company, so buying gold is a way to protect or "hedge" against losses on other investments like real estate, stocks and bonds and the effects of inflation. Investing physical gold in the form of bullion coins has several notable advantages and disadvantages. Buying physical gold, whether in the form of coins or bars, lets you control your own investment. When you have physical gold you don't have to rely on anyone else to make good decisions, keep promises or stay in business to make money. Having physical gold could also be advantageous in a disaster scenario, such as economic collapse where high inflation destroys the value of paper currency. Physical gold like gold coins has a perfect correlation to the current market prices of gold. This makes it easy to calculate the value of physical gold at any time and ensures that the value of your investment depends on the actual value of gold rather than external factors. For instance, if you invest in a gold mining company, poor decisions made the company's managers could cause the stock's value to decline, even if the value of gold rises. 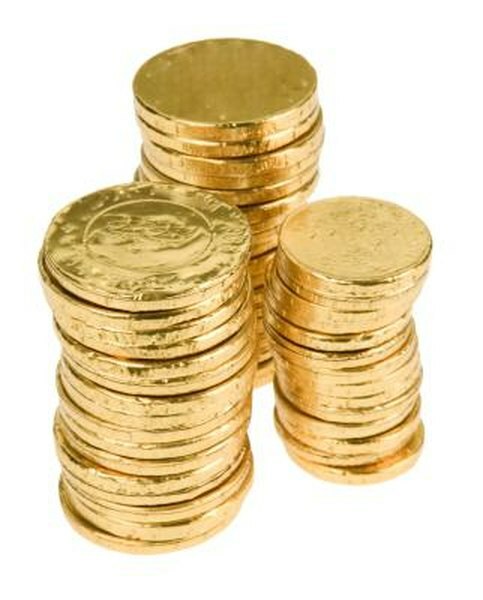 When you buy gold coins, sellers charge premiums that increase the cost of bullion above the actual market price of gold. Sellers impose premiums to compensate for costs like minting, distribution and marketing coins and to make profit. According to the U.S. Mint, it charges premiums of 3, 5, 7, and 9 percent for Gold Eagle bullion coins of one, one-half, one-quarter and one-tenth of an once respectively. Investing in physical gold requires you to find a safe place to store you coins or bars. Keeping gold in your home can be risky, due the possibility of events like floods, fires or theft. According to "USA Today," most people store gold in bank safe-deposit boxes. You may also have to pay costs related to transporting gold and for insurance. Precious metals are subject to unfavorable tax treatment by the Internal Revenue Service. Most investments, like stocks and mutual funds, are subject to a maximum long-term capital gains tax rate of 15 percent. This means you pay 15 percent tax on profits you make when selling a stock you hold longer than a year. Collectibles and precious metals are subject to a long-term capital gains tax rate of 28 percent.